Take one ex-music video director, add one rain lashed city, two cops and a race against time to prevent a serial killer from fulfilling his gruesome masterpiece, and you have Seven. Correct? Well yes and yes and possibly no, if you happen to be thinking about this grisly little offering and not Fincher’s step up to the big time. Having effectively killed off the Alien franchise with his debut feature, Seven must have seemed like one hell of a gamble for all concerned – maybe seven really is a lucky number after all. Like all successful films it was sure to spawn its fair share of imitators. This is perhaps the most consciously derivative of the films that followed in Seven’s wake. As with Fincher’s film, numbers play an important part in Resurrection’s plot. The killer is even dubbed ‘the numbers killer’ and he too is killing for a very specific reason. 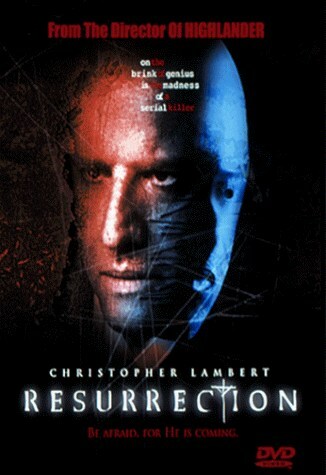 Reuniting Lambert (who also has a writing credit) with Highlander director Russell Mulcahy, this is another of those now all-too-familiar films where the killer is portrayed as more than a match for the pursuing cops, he’s as much Hannibal Lector as Seven’s John Doe. Lambert plays homicide detective John Prudhomme, a victim of personal tragedy and a crisis of faith. He’s on the edge of a nervous breakdown when he’s called to a murder scene. A body of a thirty three year old man has been found minus one arm, Roman numerals are carved into the breast and the words ‘He is coming’ is painted in blood on the window behind him. Prudhomme quickly deduces that further killings will follow. He’s right, of course. All the victims are the same age and curiously bear the names of Jesus’ disciples. Before anyone can say ‘there appears to be a killer on the loose, who’s taking body parts so he can construct his own personal messiah, just in time for Easter’ (a Frankenchrist you might say) Prudhomme is forced to face up to his own inner turmoil in order to catch said killer. Lambert has always been a curiously uncharismatic leading man. Yet there is something forever likable about him even when, as here, that naive innocence he exudes seems at odds to the embittered city cop he portrays. Leland Orser fairs much better as his partner Hollinsworth, but then Orser is a far more expressive actor usually seen playing deranged characters himself. Perhaps it is no coincidence that Orser also appeared in Seven – he’s the unfortunate guy in the massage parlour forced to kill the prostitute with a strap-on. Cult Canadian director, David Cronenberg pops up in an all too brief role as a Catholic priest. Though set in Chicago, the film was shot in Cronenberg’s hometown of Toronto. It’s actually quite a clever (and convenient) bit of casting and a masterstroke of misdirection if you haven’t already latched on to who the killer really is. This is Cronenberg after all. The gore, impressively handled throughout, culminates in the big reveal – the killer’s masterwork. It’s a fly blown patchwork mockery of the crucified Christ that makes all but the most hardened cops bring up their coffee and donuts. Even Lambert allows a look of pure horror to cross his face – maybe he was shown a graph of his career trajectory. In fact with all the biblical references on show it’s a shame no one ever bothers to comment on the unusual weather conditions where torrential downpours appear to fall from virtually cloudless blue skies. For the most part it’s a workmanlike production with occasional flashes of near brilliance. A sequence in a photographer’s studio is well handled and the appearance of the killer in that scene is likely to elicit a ‘he’s behind you’ response from the viewer. Even the blatant steals from Fincher’s film are handled reasonably well. This includes the big twist about two-thirds of the way through which, like Seven, sees our killer identified and in custody. It’s all completely daft, but so cheekily in your face you probably won’t mind much, even if you did see it coming a mile off. The clichés pile up faster than the corpses, and though it tries hard to play it straight, the makers are obviously fully aware of how ridiculous it all is. Push Fincher’s classic to the back of your mind and there’s much to enjoy here, and surely no one can hate a film where protagonist and antagonist confront each other on the storm lashed roof of a hospital and play catch with a slippery newborn baby. No, really.